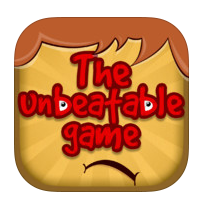 Here is a detailed walkthrough of all the solutions to The Unbeatable Game by Damilola Idowu. To see a screenshot of each question, simply click on the link associated with the specific question below. Question 1 – Just shake the device to break the glass. Question 2 – Tap on “Nephew”. Question 3 – Tap on the word “Bicyle” in the question. Question 4 – Tap on the ‘z’ in the triangle. Question 5 – Tap on the letters to spell “HUMANBEING” and tap “Confirm”. Question 6 – Tap on the “6” in the top right corner of the screen. Question 7 – Blow into the microphone of your device. Question 8 – Tap on “+” until you get to “A”, then tap “Confirm”. Question 9 – Start tapping on the red button slowly, then gradually pick up the speed and you’ll see more and more “z’s” which means the alarm is getting louder. When the alarm is “loud enough” you pass the level. Question 10 – Use two fingers to rotate the arrows until they are pointing at the correct directions. Question 11 – Tap on the “?” at the end of the question. Question 14 – The owl is awake – since owls are usually awake at night, it should be 2AM. So tap on “2 AM”. Question 15 – Tap on the letters to spell “MISSISSIPPI” then tap “Confirm”. Question 16 – Shake your device you will see 5 islandrails on the tree, then tap on “+” until you reach “5”, then tap “Confirm”. Question 18 – Just tap both words ‘The order’ at the same time using 2 fingers. Question 19 – Tap the smiling face. Question 20 – Tap “+” twice and then tap “Confirm”. (The word “Count” has 5 letters (odd); “the” has 3 letters (odd); “number” has 6 letters (even); “of” has 2 letters (even); “odds” has 4 letters (even); “here” has 4 letters (even). Therefore, total number of words with odd number of letters, is 2. Question 21 – Tap “TAP ME” quickly when the green signal is glowing. Question 24 – From the word “donkey” drag the letters “key” downwards to separate it out from the question. Question 25 – Tap “-” and “Confirm”. The answer is -1. Question 26 – Drag ‘.’ from the question and place it in front of “100” to form “.100 < 1”. Question 27 – Tap on the letters to spell “LIQUID” and tap “Confirm”. Question 28 – Drag out the ‘e’ from the word “sea” in the question. Question 29 – The answer should be “c & y”. Drag the letters “c” and “y” from the word “candy” in the question to the blanks below. Question 30 – Tap the blue button. Question 31 – Tap on the “+” until you reach “27”, then tap “Confirm”. Question 32 – Rub out the “1” from “100” to make the equation “00 < 1”. Question 33 – Carefull! Tap any one of the red balloons first, then tap the green ballon, and then tap the blue heart twice. Question 34 – Flip the device to break the egg. Question 35 – Drag the moon from the lower left hand corner and place it in the middle of the sun. Kiwis are usually awake at night so changing to night-time will wake him up. If you don’t see a moon, place your finger slightly off the screen in the lower left-hand corner and drag into the screen and you’ll see the moon. It may take several tries so be patient! Question 36 – Blow into the microphone of your device. Question 39 – Rub out the lower part of the “X” so that the equation becomes “V = V”. Question 40 – Tap “+” until you reach “5” then tap “Confirm”. Question 41 – Tap on the letters to spell “MOTHER”, then tap “Confirm”. Question 42 – Tap on the whole strawberry on the left 3 times. Question 43 – Tap on the figure shown in the pic. Question 44 – Drag the letters from the word “not” down to the blanks to spell “ton”. Question 45 – Tap on the mosquito 3 times to kill it. Question 46 – Drag any one of the inner match sticks out of the structure to form 3 squares. Question 47 – Drag the letter ‘a’ out from the word “parliament”. Question 48 – Just swipe the page towards the left to proceed. Question 49 – Turn your device anti-clockwise to open the box. Question 50 – From the word “Pizza” just before the question mark, drag letters to the blanks below to spell “pi*z*z*a”. Question 51 – Drag the letters from the words ‘three cows” to the 9 boxes below, one letter per box, in the same order. Question 52 – Hide the cloud completely with your finger for a few seconds. Question 53 – Swipe downwards with 2 fingers to go back to the previous question. Question 54 – Swipe upwards with 2 fingers twice to go to the next level. Question 55 – tap “+” until you reach “2” then tap “Confirm”. Question 56 – Tap on the letters to spell “MAP” then tap “Confirm”. Question 58 – Drag the stick (from the upper right corner of the picture) and shake it at the bushes behind the frog. The snake will come out which will scare the frog to make it jump. Question 59 – Drag the frame and place it on the fish. Question 60 – Charge your iOS device to complete the level.